Trump’s behaviour is becoming so predictable. 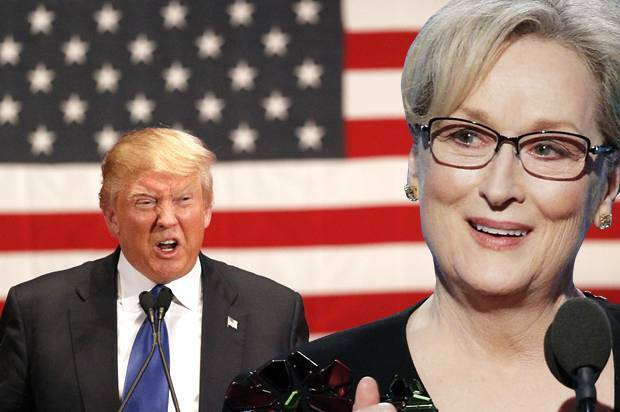 In case you missed it last night, it was the Golden Globes over in America and Meryl Streep was presented with the Cecil B. DeMille Award and used her six minute speech to denounce Donald Trump, without ever using his real name. It was pretty beautiful and you can check it out below if you want. Honestly, it’s so embarrassing now isn’t it? You really can’t have the President of the United States getting into internet slagging matches with every celebrity that disses them, can you? Ridiculous. It’s also worth noting that it took him almost 16 minutes to type those three tweets. Is he that stupid it takes him seven minutes to construct a 140 character tweet? Or did he actually spend that long choosing his choice of words on each tweet? I can’t really say they’re particularly eloquent, so I would probably be inclined to think it’s the first option. Not particularly impressive. Needless to say Meryl Streep hasn’t bothered replying to this, because that’s what adults usually do when somebody disses them. Classy. For more Donald Trump blowing up on Twitter, check out his reaction to Arnold Schwarzenegger taking over his old job on ‘The Apprentice’, just last week. Typical.